Our lab-processed temporaries will make your patients smile. They are esthetic, durable, and will not discolor. Unnatural looking or ugly provisionals are a thing of the past. All we need is your impression or pre-operative model, bite registration and opposing model. Diagnostic wax-ups are an excellent way to help your patients see how they’d look before starting a restoration. Often it’s easier to convince a patient to undergo a restoration if they can see the end-result first. Send us your pre-op models with instructions, the type of restoration you are planning, and any teeth you will be extracting and we will wax up your desired results. When sending a diagnostic wax-up case for which there is no existing dentition or restoration that the patient likes and wishes to duplicate, please utilize the LVI Smile Catalog. 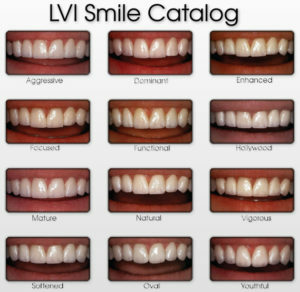 The LVI Smile Catalog allows the patient to choose from 12 distinctly different styles. Simply inform us on the Rx which style the patient desires and we will use it for fabrication of the prescribed product. Of course, changes can be made as necessary to fit the specific patient’s desires. The VITAPAN classical Shade Guide is the most widely used shade system with more than 40 years of worldwide recognition. Chromascop is the universal shade guide for the innovative Ivoclar Vivadent product range. Twenty chromatically arranged shades make shade selection within the wide range of Ivoclar Vivadent products quicker and more accurate. The practice-oriented Chromascop shade guide is the ideal working tool for dental professionals. Ivoclar also offers the Chromascop bleach shade guide, consisting of four shades, for patients whose teeth are whiter than shades offered in the traditional Chromascop shade guide. The Vita Toothguide 3D-Master shade guide makes it easy to determine the natural shade of teeth with great accuracy. The Vita Bleached Shade Guide makes it easy to accurately determine the shade of bleached teeth employing the same principles as the Vita Toothguide. The Vita Bleachedguide 3D-Master makes it easy and simple to plan and monitor the tooth whitening process. The shade guide uses three parameters to define shade: brightness (value), chroma (saturation), and hue (color). The Bleachedguide also incorporates all 29 shade levels defined by the American Dental Association (ADA). Furthermore, it includes new intermediate shade tabs that make measuring the bleaching process even more precise.